On Monday came the not surprising news that Peanut Corporation of America (PCA) has filed for bankruptcy. The practice of selling food additives laced with salmonella bacteria makes it difficult to win back the trust of customers that had been so grievously violated. PCA’s actions to knowingly ship contaminated products that have resulted in nine deaths and have sickened 637 people in 44 states. PCA’s salmonella laced peanut paste has contaminated 2,226 processed food products. A full list of recalled products can be found on the FDA website. These potentially criminal acts by PCA’s management has demolished the PCA corporate brand making it impossible to continue as a going concern. The Chapter 7 bankruptcy filing will liquidate the company. This strategy will protect the PCA shareholders in the privately held firm from the significant legal liability that this event has created. It does not however protect PCA’s company management and accomplices that knowingly shipped contaminated products from potential criminal prosecution. Criminal persecution of those involved should be pursued and if anyone is found guilty punishment must be severe.PCA released its contaminated product into a large and extensive supply chain. Many leading brand food processing manufacturers that use PCA’s peanut paste as an ingredient in their packaged goods products have suffered severe reputational damage to their product and company brands. 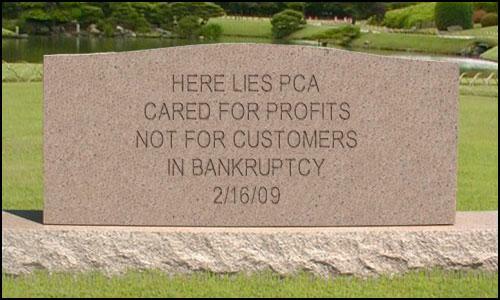 Though PCA’s corporate liability may be mitigated with the bankruptcy filing, aggrieved consumers will continue to have have legal recource by filing suits against the major consumer product companies that are still in business. This could make for a record breaking class action product liability suit. Unfortunately this tragic occurrence could have been prevented. PCA’s actions demonstrate a disturbing ambivalence toward effective sound corporate governance practices. Companies that willingly sacrifice risk management and ethical business practices for the sake of short term profits consistently undermine corporate sustainability. All may not result in a dramatic corporate implosion like PCA. But ultimately the song of corporate liquidations remains the same. Unemployment for workers, aggrieved consumers, community desertion, tortured consciences and and in some instances criminal prosecution.